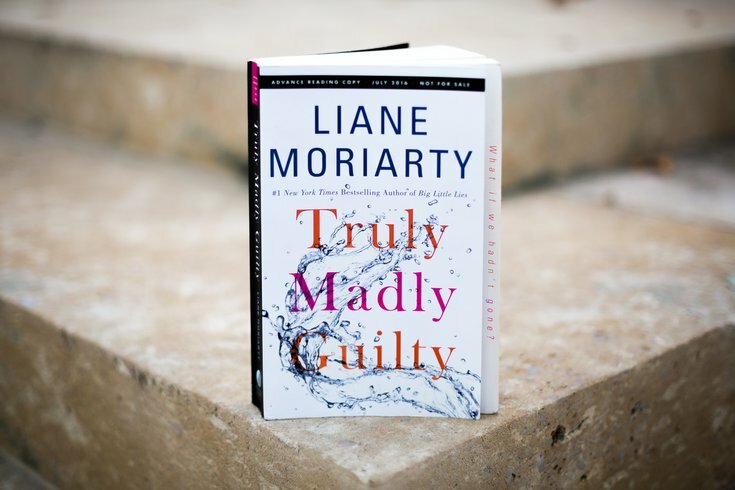 Truly Madly Guilty by Liane Moriarty. Summer of 2014, Liane Moriarty's Big Little Lies was one of the biggest reads of the season. That shattered lollipop cover could be seen peeking out of beach bags and laying dogeared on coffee tables as it got passed from friend to friend to friend. The you-have-to-read-this mentality made Moriarty a best-selling author and a household name. In her latest book, Truly Madly Guilty, Moriarty attempts to re-create the magic by repeating storytelling techniques from Lies. Each chapter is a hint; each character shares a sliver of the whole story. Another seemingly innocent setting — this time, a barbecue instead of a kindergarten — becomes the dramatic epicenter. Clementine and Erika grew up together, as close as sisters. One afternoon, Erika and her husband, Oliver, invite Clementine and her husband, Sam, over to their house. Their afternoon tea is turned into a backyard barbecue when Erika's next door neighbor Vid invites both couples and Clementine's kids over to spend the day with his wife and young daughter. After the barbecue, though, everyone wishes the get-together had never occurred — Vid's daughter explains it best to the adults: "You feel regret." But why? Moriarity makes the reader work for the big reveal. The book runs unnecessarily long. Sure, clues can be found in each chapter, but whole pages can feel superfluous. Characters becoming drained by their guilt leaves readers tired too. Moriarity makes up for the extreme build-up — and inequivalent payoff — by giving readers an honest portrayal of friendship. Friendship between neighbors, between spouses and between parent and child are given weight within the story but the most interesting subject she explores is how childhood friendships can shape adult lives. Clementine wonders if her entire persona is based on being an opposite of Erika. Their relationship is anything but easy. Erika feels saved by her best friend, while Clementine still feels obligated to heed her mother's childhood advice to "be kind" to the weird kid. Trying to be unlike serious Erika may have led Clementine into a marriage that started with lots of laughs but can't handle the tough times. Oliver, in a genuinely touching moment, reminds Erika, "Don't you know I'm your best friend?" The trials, triumphs and revelations of Clementine and Erika's friendship save Truly Madly Guilty.